So. Here are the options I’m currently considering. Could you pretty please let me know what you think? Tangled Chandelier – Persimmon – $285. I love it. It’s cool and unique, but maybe TOO unique? It comes in green or yellow as well, but I like the red the best. But red would probably freak people out. Brass and a blackened brass are options as well, for an extra $100, but if I go that route shouldn’t I just go for #11 instead and save some cash? Varaluz Wright Stuff 3-Light Black Pendant – $399. Expensive. Too crazy? It’s a little aggressive-looking, somehow. Clive Chandelier – $379. O.M.G. So this is the chandelier that I had my heart set on. $&*(@! I love it! I used it in my mood boards here and here! Weep. Any suggestions for a similar fixture? Two-Tone Pendant Lamp – $65 each pendant. So how cool would it be to do a cluster of these in different colors? Answer – so cool. But again, maybe too weird for a flip. Bentwood Pendant – $189 each. This seems like a very viable option, but it just has a single bulb. Industrial Chandelier – $249. I like this one a lot, but for all you bare-bulb-haters out there, would it singe your eyeballs? Mobile Chandelier – $249. So I’m thinking this one might be the new frontrunner. It’s pretty awesome, right?!? Liberty Pendant – $229. Pretty, but you can’t avoid that brass. I’m digging brass these days, but we’ve now learned that not everyone has jumped on that bandwagon! Diamond Kiss Pendant – $179. Kind of like #2, but less aggressive. The cone shade softens it somehow. Radial Chandelier – $299. This one is a good option, but I wonder if it looks a little too industrial? That ring is flattened black metal, which seems pretty utilitarian. Peel Pendant Lamp – $199. Kind of like #5 but with some sassy orange highlights peeking through. Just one bulb. Young House Love Geometric Diamond Lantern – $99. Pretty, but not enough oomph to hold the dining space, I don’t think. Oversized Cone Paper Shade Pendant – $269. I like this one (I like the one with the gold interior even better! ), but I’m not sure it goes with the vibe we’re going for. Multi Glass Orb Chandelier – $358. Love it. Maybe this is the winner? Be Squared Modern Chandelier – $279. Really cool, but it has some brass – would buyers run screaming? Uttermost Paxton 1 Light Pendant – $206.80. A cheaper version of #2, but with only one bulb. What is with chandeliers with only one bulb?!? Do people eat in the dark? So, in a nutshell, since I can’t have Clive I’m leaning towards #1, #7, #8, #13 or #16. Do you have a favorite? Or maybe an entirely different option? Help a girl out!! A collection of three from #5 or number 7! Oooooh! No. 16 is my favorite too! I love 16 too! It seems like it’s different enough that people probably haven’t seen it in every (any) other house they’re looking at but is still neutral enough that people aren’t as likely to be like, “Well that’ll have to go” <–says every light fixture in my house. I've been loving the lighting round-ups. So helpful for my current replace-every-light situation. The ones you have narrowed down to are mostly on the upper end of the cost scale. You should get the Clive and cut $100 from the budget somewhere else IMO. Of course, I think great light fixtures are worth it. Can’t wait to see what you choose! I like 6 and 11 the best. I like a bare bulb! Your bath is looking AWESOME!!! So I was against the bare bulbs in the kitchen sconces, but I am in love with #6. 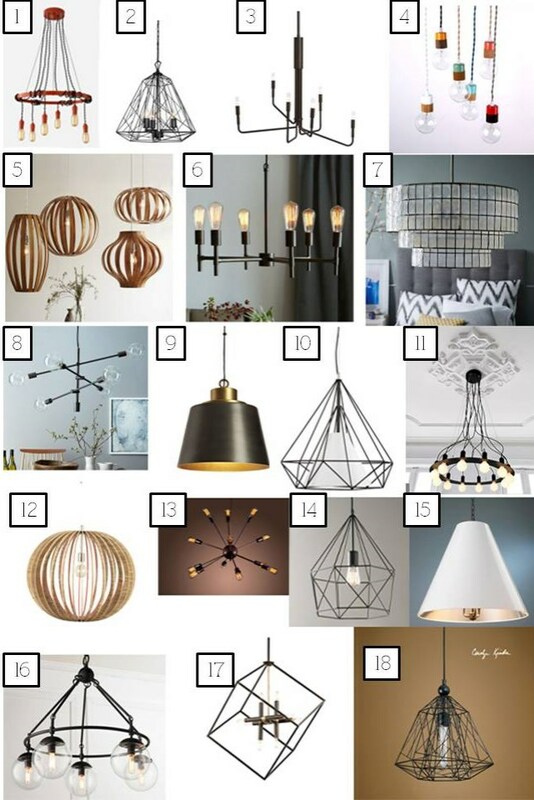 #7 is a very close second, but I love how #6 is a modern and sleek take on the classic multi-armed chandelier. It would be worth the splurge of buying special bulbs just to have that fixture! Hi! I do love 16 although it might be an eye-singer in person? I have a suggestion for you – would you considered the Crate & Barrel Eclipse Antiqued Bronze Pendant Light? It’s much more subdued, style-wise than your pics, but the color of the shade and the hardware could be nice. I’ve also seen this light in real life and it gives of a wonderful glow. Can’t wait to see the finished rooms! We just used the Firefly Pendant from CB2. It’s 5 bare bulbs, and hangs low so it’s definitely an eye – burner. In retrospect, I would have chosen otherwise. I think #14 is very cool but I think you are right when saying one of those wouldnt be enough so why not do a group of them, like two or three in a row or three hanging at different heights. #16 – Elegant with an industrial vibe. Love it. I really like #16 … It reminds me of our new chandelier. Ours is the Eclipse and it’s from West Elm. It was really affordable too! Before reading your comments, I picked 8 and 16. Then got excited that those are some of your favs too! #15 is out. honestly, I fear that #10 has some of the same weakness, which is looking too much like a pendant. If you choose any one-bulbers, be sure that they have substance and can take a bright bulb too! #16 looks like you were too chicken for #11 or 6, heh. #17 I could see (after I looked it up to confirm it’s pretty big), as it has nice size but not too much Blub Face — wouldn’t worry about the brass in that instance, because it subserves the industrial aesthetic. That could be pretty spiff, if you want a bit more airiness than the cage and pipe crowds. Thanks for letting us shop along! There are a couple options that I like but since I want to try and help I would have to go with #16!! I was looking through the comments and realized that is a very popular choice, ha. Of course it’s one of the more spendy options but in the long run quality is better if you can afford it I think:). Best of luck and I’ll continue to see how it goes.